A charter bus is important for those times when you need to travel as a large group. 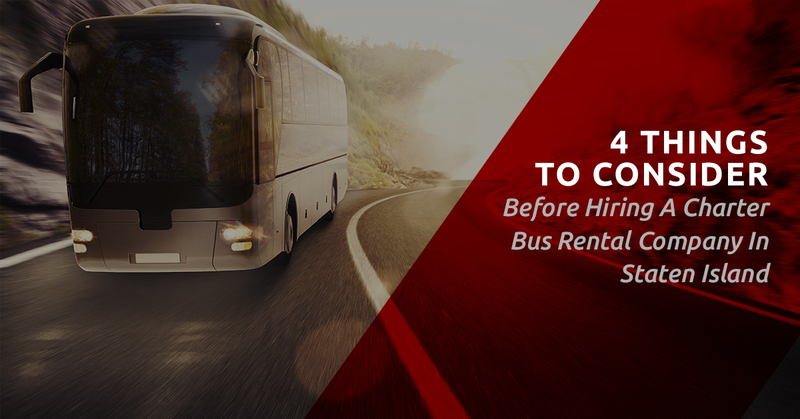 The trip could be a tour, a road trip or a special event, but before you start looking for a bus charter company in New York City, there are important things you should consider to ensure nothing catches you by surprise and that everything goes smoothly. At American Dream Coaches, we offer charter bus rental services in the Staten Island, New York area. Our business was established in 2005, and we take pride in our excellent customer service as well as our 24-hour availability for our customers. Are you in need of a charter bus rental or other van transportation services? Book our charter bus today here! 1. The reliability of the charter rental company. The first thing you should do is find out more about the New York charter bus company you’re interested in. How long have they been in business? What do their previous customers say about them through their customer reviews? Are they known for safety and reliability? You need a bus that will reliably and safely transport you to your destination and back. To make the best choice, it is advisable to compare three or four companies. Look for information concerning the quality of their services and see which one has the best reputation. 2. The driver costs of the charter rental. Any bus charter rental company in the New York area will provide your group with a driver for the length of the whole trip. You need to know that most companies will expect you to fund the accommodation and food costs for the driver if the trip is overnight. You, therefore, need to consider this in your budgeting. If your trip goes for several days, it means more food and accommodation costs for the driver. Sometimes, for long trips, it will be necessary for the company to provide more than one driver. This drives up the overall cost further. Naturally, this is the first thing on most people’s minds when hiring a charter bus. Unlike flights, it is not easy to find the charter rates for different charter bus companies. The best thing is to pick out three or four companies and then request for quotes from their websites. Describe the number of people in your group, the length of the trip and anything else that may be requested. Once you receive the quotes, compare them and choose the one that best fits your budget. Check if you can get a discount from any of the company. Make sure that you do not compromise on safety and quality by choosing the cheapest charter. In a hurry to sign off on a deal, many people forget to read the fine print. This is where companies detail their cancellation policy. Anything can come up forcing you to cancel or postpone your trip — that’s why it’s important to know what the company’s cancellation policy is. Some companies give you up to a certain time to cancel without any penalty whatsoever. Others will keep your deposit if you cancel past that time or on the day of the trip. Others have harsher policies where you are charged part of the overall cost if you have a late cancellation. In addition to all of the above, understand any other policies the company may have regarding hiring a charter bus. If you have any doubts or questions, ask them before you agree on anything. Choose American Dream Coaches today for all your charter bus rental services in Staten Island! Call us at (888) 747-8570 or fill out our online form for more information.